" A] future cult classic." --The New York Times Book Review"There's Borges and Bola o, Kafka and Cort zar, Modiano and Murakami, and now Laura van den Berg." --The Washington PostNamed a Best Book of 2018 by The Boston Globe, Huffington Post, Electric Literature and Lit Hub. An August 2018 IndieNext Selection. Named a Summer 2018 Read by The Washington Post, Vulture, Nylon, Elle, BBC, InStyle, Refinery29, Bustle, O, the Oprah Magazine, Entertainment Weekly, Harper's Bazaar, Conde Nast Traveler, Southern Living, Lit Hub, and Vol. 1 Brooklyn.In Havana, Cuba, a widow tries to come to terms with her husband's death--and the truth about their marriage--in Laura van den Berg's surreal, mystifying story of psychological reflection and metaphysical mystery.Shortly after Clare arrives in Havana, Cuba, to attend the annual Festival of New Latin American Cinema, she finds her husband, Richard, standing outside a museum. He's wearing a white linen suit she's never seen before, and he's supposed to be dead. Grief-stricken and baffled, Clare tails Richard, a horror film scholar, through the newly tourist-filled streets of Havana, clocking his every move. As the distinction between reality and fantasy blurs, Clare finds grounding in memories of her childhood in Florida and of her marriage to Richard, revealing her role in his death and reappearance along the way. 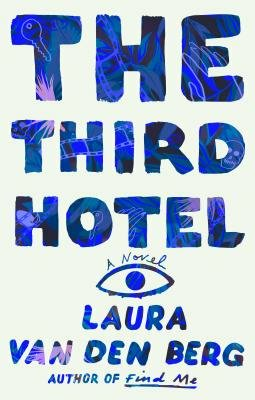 The Third Hotel is a propulsive, brilliantly shape-shifting novel from an inventive author at the height of her narrative powers. THE THIRD HOTEL is neither a long book nor a dense one. But the entirety of it is much greater than the sum of its parts. Author Laura van den Berg explores a number of themes in this haunting tale of unresolved grief and loss against a backdrop that is by turns tarnished and shimmering. One does not need to have had the same experiences as the book's protagonist to crawl into her skin and become trapped beneath.... Van den Berg's exquisite descriptions of Havana, the film festival, the attendees and Clare herself persuasively propel the reader deeper into the book in search of what may or may not be the mystery at its core. Reading Laura van den Berg's disquieting new novel, "The Third Hotel," is akin to walking out of a dark movie theater into bright sunlight. Part of you is still living in a cinematic dreamscape. The real world is what's imaginary.... As in Van den Berg's short stories and her novel "Find Me," the writing is lovely and fluid. She is comfortable with ambiguity, and "The Third Hotel" isn't intent on resolution. Clare's eerie perceptional wobbles are conjured beautifully by van den Berg, who sees like a painter and narrates like a crime reporter. To read The Third Hotel'' sometimes feels like following a character based on Joan Didion sinking deeper into a universe whose laws were written by Patricia Highsmith.... The Third Hotel ought to be read slowly. Unlike so many books set in this part of the world, it refuses to project itself onto the place. Havana is there, evoked, but not possessed. The book enthusiastically (and, I presume, deliberately) derails itself again and again. Scenes begin with clear goals in mind, then are sidetracked; questions, pointedly asked, go unanswered.... What we get instead of narrative momentum is a richness of theme and an abundance of detail. Van den Berg's previous work, her short stories in particular, are prized for their thoughtfulness and descriptive intensity, and this book seems to me a refinement and intensification of those skills.... Don't take the bait when The Third Hotel starts voguing like a thriller. Instead, read it as the inscrutable future cult classic it probably is, and let yourself be carried along by its twisting, unsettling currents. The acclaimed author of two story collections and a novel, van den Berg has always been good, but with The Third Hotel she's become fantastic  in every sense of the word.... The fantastic plot is elevated by van den Berg's fantastic writing and unique twists of language.... [S]o much subtextual lava is coursing under the surface of every page of The Third Hotel the book feels like it's going to erupt in your hands.